Vashon’s "Sharing the Stage" series will launch its fourth season at 7:30 p.m. Thursday, with a concert by Zac Anthony and Kate Goldby of the Australian pop band The Wellingtons. The show will take place at Red Bicycle Bistro & Sushi. The series, presented by Islanders Fred Strong, Harris Levinson and Rob Bordner, gives Island youth musicians, poets and other performers a chance to take the stage with acclaimed music acts from the Pacific Northwest and beyond. So far, Sharing the Stage has boasted concerts by Visqueen, Macklemore & Ryan Lewis, Thomas Marriott and the Blue Scholars. A long list of talented Vashon teens have opened the shows. This time around, opening acts will include Skyler Ford, Cameron Sonju, and The Funions, a band made up of Peyton Levin, Duncan Ende, Nick Barber and Tanner Montague. It’s the first time on Vashon for the band, and the first stop on their new world tour. Tickets to the show are $5 for students and $10 for adults. 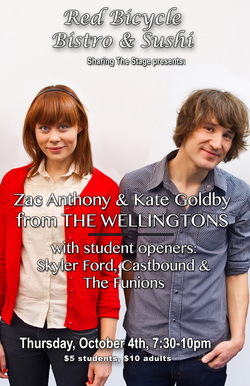 Follow the buzz about the show at www.facebook.com/thewellingtons.